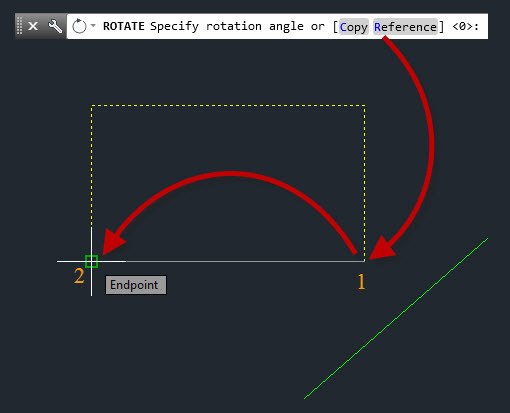 The Rotate command can be used to match an angle of an existing object or allow you to input an angle. 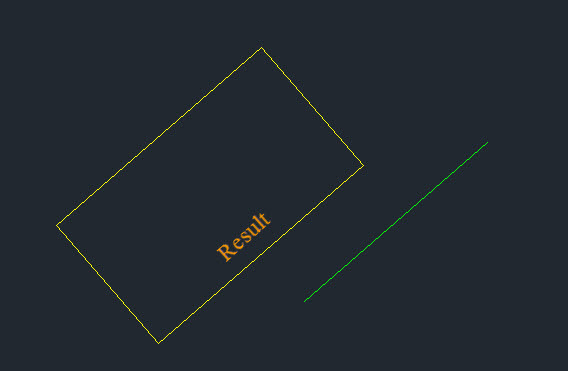 Select The objects that need to be rotated. 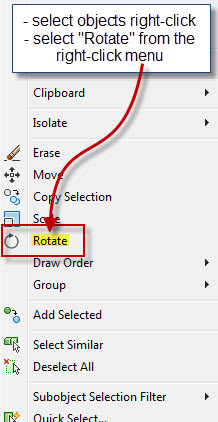 Tip: You can Start the Rotate command from the right-click menu. 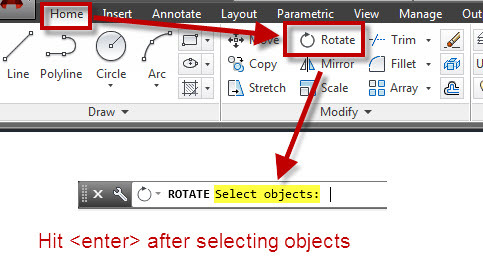 Simply select the objects and then right-click and select “Rotate” Also note the other command that are available from this menu. 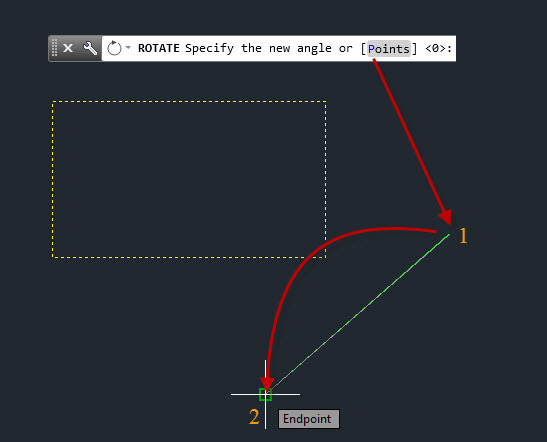 Specify the base point for the rotation. The base point is the pivot point that the objects will rotate around. Then pick 2 points to define the angle of the objects. This angle will match the angle in the next step. Use the sub-option “Points” by clicking the blue P or by using P <enter> in the command line. 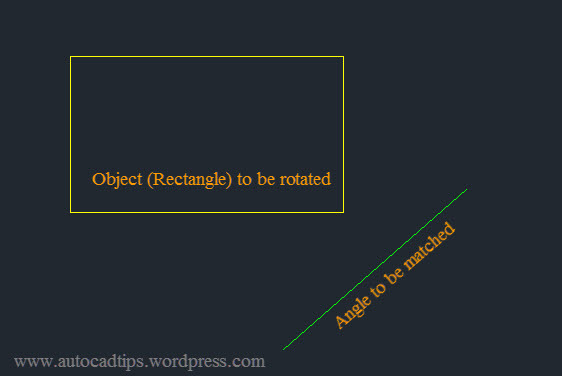 Pick 2 points to define the angle for the rotated objects. Note: The order of the picked points from the “Reference” option will match the order of the “Points” option of the command. 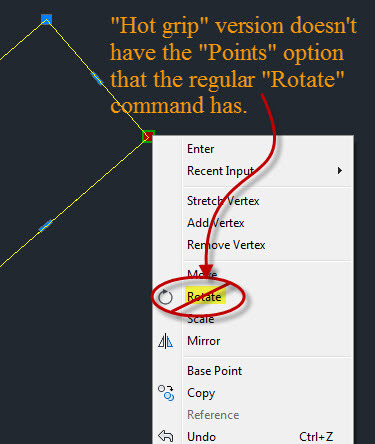 Tip: The hot-grip method of the “Rotate” command does not have the “Points” sub-option of the command so it will help have the same result. The hot grip method lets you start some command without entering a command. You simply select the objects and then click on any grip. Notice how it becomes red? This is a “hot-grip.” Now if you right click, you see a limited (and different) right click menu. You can start other command from this menu. This entry was posted in BASICS, Modifying, TIPS. Bookmark the permalink. I agree – it is too many clicks. But it is good to know that without any programming knowledge that it is able to accomplish rotating with a reference. Thanks for the lisp routine. I will try it in a little bit. This makes me want to try to make an action macro to try to do the same thing. 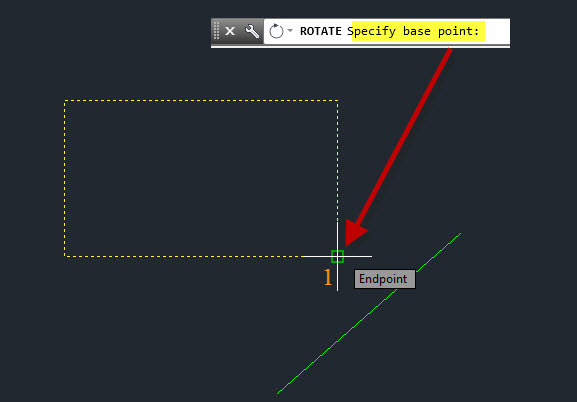 That way, the AutoCAD LT folks can have an easier method as well. Use align if you want your object to be moved. If you want it to pivot around a point where it is currently – use this option. Thanks for a great post – I really needed it to not look like a fool!